The National Pokédex makes its return in the Hoenn region. This time, you will get the National Pokédex organically in the story. When you have subdued Primal Groudon/Kyogre and defeated Wallace in the Sootopolis City Gym, Wallace will say that Professor Birch wants to speak to you in Littleroot Town, go to visit him and he will inform you of the influx of Pokémon not native to the Hoenn region and say that the Pokédex can be upgraded. Prior to this, if you capture any Pokémon that aren't in the Pokédex, it will tell you that they have not been registered in the Hoenn Region. You have the ability to switch between both of the Pokédexes at will when you load up the Pokédex and in the National Pokédex, the top screen will show all the Pokémon in the generation of the one you're looking at rather than the entire Pokédex Line-up. As always, there are gifts for completion of the Pokédex. As usual, when you go to the Lilycove Hotel and speak to the Game Director, you'll get a diploma that you can then display on your Secret Base's wall. 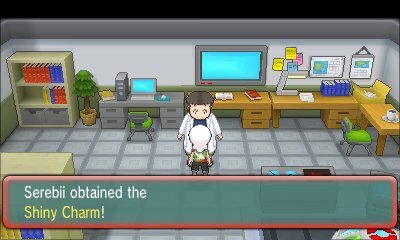 Also, like every game isince Black 2 & White 2, when you have captured almost all the Pokémon in the National Pokédex, you will receive the Shiny Charm item which makes Shiny Pokémon more likely to appear. Despite it being an award for completion, there are some Pokémon that are not required in order to obtain the National Pokédex. 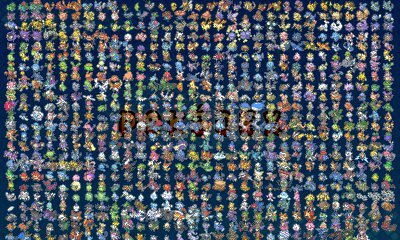 Most of these are Mythical Pokémon, but you can obtain it completely and 100% without these Pokémon registered.